Many business and operational processes require you to analyze large volumes of frequently updated data. Log analysis, for example, involves querying and visualizing large volumes of log data to identify behavioral patterns, understand application processing flows, and investigate and diagnose issues. VPC flow logs capture information about the IP traffic going to and from network interfaces in VPCs in the Amazon VPC service. The logs allow you to investigate network traffic patterns and identify threats and risks across your VPC estate. Flow log data is stored using Amazon CloudWatch Logs. After you’ve created a flow log, you can view and retrieve its data in Amazon CloudWatch Logs. Flow logs can help you with a number of tasks. For example, you can use them to troubleshoot why specific traffic is not reaching an instance, which in turn can help you diagnose overly restrictive security group rules. You can also use flow logs as a security tool to monitor the traffic that is reaching your instance. This blog post shows how to build a serverless architecture by using Amazon Kinesis Firehose, AWS Lambda, Amazon S3, Amazon Athena, and Amazon QuickSight to collect, store, query, and visualize flow logs. In building this solution, you will also learn how to implement Athena best practices with regard to compressing and partitioning data so as to reduce query latencies and drive down query costs. Send VPC Flow Logs to S3 for Analysis with Athena. This section describes how to use Lambda and Firehose to publish flow log data to S3, and how to create a table in Athena so that you can query this data. Visualize Your Logs in QuickSight. Here you’ll learn how to use QuickSight and its Athena connector to build flow log analysis dashboards that you can share with other users in your organization. Partition Your Data in Athena for Improved Query Performance and Reduced Costs. This section shows how you can use a Lambda function to automatically partition Athena data as it arrives in S3. This function will work with any Firehose stream and any other delivery mechanism that writes data to S3 using a year/month/day/hour prefix. Partitioning your data is one of three strategies for improving Athena query performance and reducing costs. The other two are compressing your data, and converting it into columnar formats such as Apache Parquet. The solution described here automatically compresses your data, but it doesn’t convert it into a columnar format. Even if you don’t convert your data to a columnar format, as is the case here, it’s always worth compressing and partitioning it. For any large-scale solution, you should also consider converting it to Parquet. Below is a diagram showing how the various services work together. When you create a flow log for a VPC, the log data is published to a log group in CloudWatch Logs. By using a CloudWatch Logs subscription, you can send a real-time feed of these log events to a Lambda function that uses Firehose to write the log data to S3. Once the flow log data starts arriving in S3, you can write ad hoc SQL queries against it using Athena. For users that prefer to build dashboards and interactively explore the data in a visual manner, QuickSight allows you to easily build rich visualizations on top of Athena. In this section, we’ll describe how to send flow log data to S3 so that you can query it with Athena. The examples here use the us-east-1 region, but any region containing both Athena and Firehose can be used. Follow the steps described here to create a Firehose delivery stream with a new or existing S3 bucket as the destination. Keep most of the default settings, but select an AWS Identity and Access Management (IAM) role that has write access to your S3 bucket and specify GZIP compression. Name the delivery stream ‘VPCFlowLogsDefaultToS3’. First, follow these steps to turn on VPC flow logs for your default VPC. Before you create a Lambda function to deliver logs to Firehose, you need to create an IAM role that allows Lambda to write batches of records to Firehose. Create a role named ‘lambda_kinesis_exec_role’ by following the steps below. First, embed the following inline access policy. Then, attach the following trust relationship to enable Lambda to assume this role. From the Lambda console, create a new Lambda function and select Blank Function. Choose Next when asked to configure a trigger. On the Configure function page, name the function ‘VPCFlowLogsToFirehose’. Select the Python run-time, and copy this code from GitHub into the code pane. Specify the ‘lambda_kinesis_exec_role’ you created in the previous step, and set the timeout to one minute. Choose the log group for your VPC flow logs (you might need to wait a few minutes for the log group to show up if the flow logs were just created). For Actions, choose Stream to AWS Lambda. Select the ‘VPCFlowLogsToFirehose’ Lambda function that was created in the previous step. For the format, choose Amazon VPC Flow Logs. 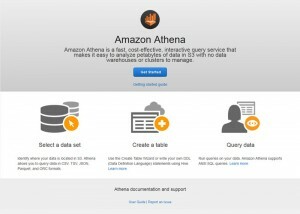 Amazon Athena allows you to query data in S3 using standard SQL without having to provision or manage any infrastructure. Athena works with a variety of common data formats, including CSV, JSON, Parquet, and ORC, so there’s no need to transform your data prior to querying it. You simply define your schema, and then run queries using the query editor in the AWS Management Console or programmatically using the Athena JDBC driver. You will need to replace <bucket_and_prefix> with the name of the Firehose destination for your flow log data (including the prefix). The CREATE TABLE definition includes the EXTERNAL keyword. If you omit this keyword, Athena will return an error. EXTERNAL ensures that the table metadata is stored in the data catalog without impacting the underlying data stored on S3. If you drop an external table, the table metadata is deleted from the catalog, but your data remains in S3. The columns for the vpc_flow_logs table map to the fields in a flow log record. Flow log records comprise space-separated strings. To parse the fields from each record, Athena uses a serializer-deserializer class, or SerDe, which is a custom library that tells Athena how to handle your data. The DDL specified here uses a regular expression SerDe to parse the space-separated flow log records. The regular expression itself is supplied using the “input.regex” SerDe property. In the Athena query editor, enter the DDL below, and choose Run Query. After creating the table, you should be able to select the eye icon next to the table name to see a sample set of rows. QuickSight allows you to visualize your Athena tables with a few simple clicks. You can sign up for QuickSight using your AWS account and get 1 user and 1 GB of SPICE capacity for free. Before connecting QuickSight to Athena, make sure to grant QuickSight access to Athena and the associated S3 buckets in your account as described here. You can then create a new data set in QuickSight based on the Athena table you created. Log into QuickSight and choose Manage data, New data set. Choose Athena as a new data source. Name your data source “AthenaDataSource”. Select the default schema and the vpc_flow_logs table. Choose Edit/Preview data. For starttime and endtime, set the data format as a date rather than a number. These two fields represent the start and end times of the capture window for the flow logs and come into the system as Unix seconds timestamps. Now select Save and visualize. Let’s look at the start times for the different capture windows and the amount of bytes that were sent. We’ll do this by selecting StartTime and Bytes from the field list. Notice QuickSight will automatically display a time chart with the amount of traffic. 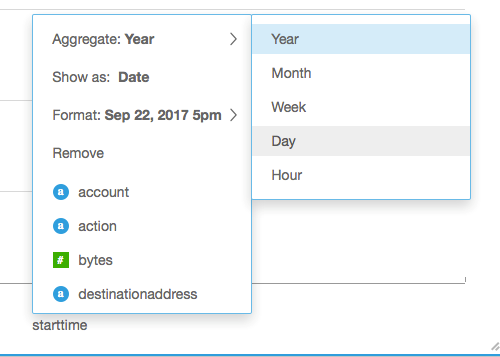 You can easily change the date parameter to set different time granularities. Here is an example showing a large spike of traffic for one day. This tells us that there was a lot of traffic on this day compared to the other days being plotted. You can easily build a rich analysis of REJECT and ACCEPT traffic across ports, IP addresses, and other facets of your data. You can then publish this analysis as a dashboard that can be shared with other QuickSight users in your organization. The solution described so far delivers GZIP-compressed flow log files to S3 on a frequent basis. Firehose places these files under a /year/month/day/hour/ key in the bucket you specified when creating the delivery stream. The external table definition you used when creating the vpc_flow_logs table in Athena encompasses all the files located within this time series keyspace. Athena is priced per query based on the amount of data scanned by the query. With our existing solution, each query will scan all the files that have been delivered to S3. As the number of VPC flow log files increases, the amount of data scanned will also increase, which will affect both query latency and query cost. Partitioning your table helps you restrict the amount of data scanned by each query. Many tables benefit from being partitioned by time, particularly when the majority of queries include a time-based range restriction. Athena uses the Hive partitioning format, whereby partitions are separated into folders whose names contain key-value pairs that directly reflect the partitioning scheme (see the Athena documentation for more details). The folder structure created by Firehose (for example, s3://my-vpc-flow-logs/2017/01/14/09/’) is different from the Hive partitioning format (for example, s3://my-vpc-flow-logs/dt=2017-01-14-09-00/). However, using ALTER TABLE ADD PARTITION, you can manually add partitions and map them to portions of the keyspace created by the delivery stream. The solution presented here uses a Lambda function and the Athena JDBC driver to execute ALTER TABLE ADD PARTITION statements on receipt of new files into S3, thereby automatically creating new partitions for Firehose delivery streams. Before you create the Lambda function, you will need to create an IAM role that allows Lambda to execute queries in Athena. Create a role named ‘lambda_athena_exec_role’ by following the instructions here. The vpc_flow_log external table that you previously defined in Athena isn’t partitioned. To create a table with a partition named ‘IngestDateTime’, drop the original, and then recreate it using the following modified DDL. Clone the Lambda Java project from GitHub. Compile the .jar file according to the instructions in the README file, and copy it to a bucket in S3. Create a new Lambda function and select Blank Function. On the Configure function page, name the function ‘CreateAthenaPartitions’. For Code entry type, choose Upload a file from Amazon S3. For the S3 link URL, enter the HTTPS-format URL of the .jar file you uploaded to S3. PARTITION_TYPE: Supply one of the following values: Month, Day, or Hour. This environment variable is optional. If you omit it, the Lambda function will default to creating new partitions every day. For this example, supply ‘Hour’. TABLE_NAME: Use the format <database>.<table_name>—for example, ‘default.vpc_flow_logs’. ATHENA_REGION: The region in which Athena is located. For this example, use ‘us-east-1’. Finally, set the timeout to one minute. Select the ‘CreateAthenaPartitions’ Lambda function from the dropdown. Now, whenever new files are delivered to your S3 bucket by Firehose, your ‘CreateAthenaPartitions’ Lambda function will be triggered. The function parses the newly received object’s key. Based upon the year/month/day/hour portion of the key, together with the PARTITION_TYPE you specified when creating the function (Month, Day, or Hour), the function determines which partition the file belongs in. It will then query Athena to determine whether this partition already exists. If the partition doesn’t exist, the function will create the partition, mapping it to the relevant portion of the S3 keyspace. Looking at the S3 key for this new file, the Lambda function will infer that it belongs in an hourly partition whose spec is ‘2017-01-14-07’. On checking Athena, the function discovers that this partition does not exist, so it executes the following DDL statement. If the Lambda function had been configured to create daily partitions, the new partition would be mapped to ‘s3://my-vpc-flow-logs/2017/01/14/’; if monthly, the LOCATION would be ‘s3://my-vpc-flow-logs/2017/01/’. Note that the partitions represent the date and time at which the logs were ingested into S3, which will be some time after the StartTime and EndTime values for the individual records in each partition. Your queries can now take advantage of the partitions. To query the data ingested over the course of the last three hours, run the following query (assuming you’re using an hourly partitioning scheme). As the following screenshots show, by using partitions you can reduce the amount of data scanned per query. In so doing, you can reduce query costs and latencies. The first screenshot shows a query that ignores partitions. This second screenshot shows the use of partitions in the WHERE clause. As you can see, by using partitions this query runs in half the time and scans less than a tenth of the data scanned by the first query. This blog post discusses using Kinesis Data Firehose to load flow log data into S3. You can easily modify this to write to other destinations such as Amazon Elasticsearch Service and Amazon Redshift. If S3 is your final destination as illustrated preceding, a best practice is to modify the Lambda function to concatenate multiple flow log lines into a single record before sending to Kinesis Data Firehose. Doing this reduces the costs associated with the delivery stream. In the past, to analyze logs you had to extensively prepare data for specific query use cases or provision and operate storage and compute resources. With Amazon Athena and Amazon QuickSight, you can now publish, store, analyze, and visualize log data more flexibly. Instead of focusing on the underlying infrastructure needed to perform the queries and visualize the data, you can focus on investigating the logs. Ian Robinson is a Specialist Solutions Architect for Data and Analytics. He works with customers throughout EMEA, helping them to use AWS to create value from the connections in their data. In his spare time he’s currently restoring a reproduction 1960s Dalek.